In the introduction of your essay the first thing you must do is paraphrase the topic question by using synonyms or changing the word formation , if you just copy the original question you will lose points. A good technique is changing the form of the words by using: a verb, gerund, adjective or noun. Look at the examples below. I have changed two words above from gerund + verb to noun + preposition + noun + gerund and re-ordered the sentence slightly. Using this technique, you need to be confident with your grammar if you decide to change the word formation. You have to be careful when using synonyms though, click here to see a lesson about learning new words and the dangers of synonyms. Here is a task question, you will notice it is a problem solution essay. Choose words from the list and try paraphrasing it. You do not need to paraphrase the instruction words. Check my answer when you have finished. Practice it first before checking my answer. 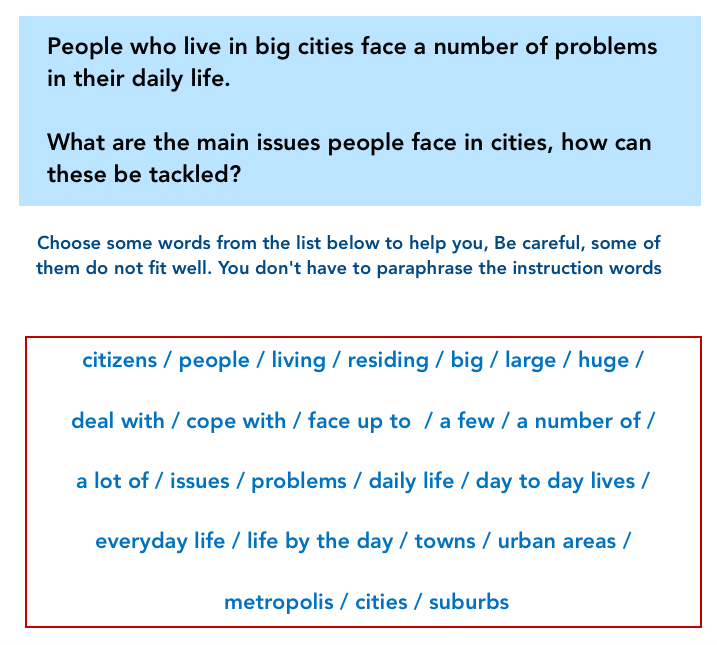 a) People residing in large urban areas have to deal with a lot of issues in their day to day lives. b) There are a number of issues that people living in cities have to cope with in their everyday lives. I did not use the word ‘citizens ‘as it doesn’t fit well, the word ‘people’ is hard to paraphrase so I kept it. Some words cannot be used here such as ‘ suburbs’ or ‘towns’ there is a difference in meaning to ‘cities’ . Also the word ‘huge’ doesn’t not feel right here so I didn’t use it. Remember that not every word has to be paraphrased, there is no black and white answer to paraphrasing, it depends on your vocabulary and how you can use synonyms correctly. Make sure the meaning stays the same or you will lose marks. Try it yourself before checking my answer. a) The Internet, which is a huge source of knowledge, has created opportunities for people worldwide to study. b) The world wide web is a massive source of information and has given people the ability to study all over the world. Some words do not go well here such as ‘ folks’ which is too informal and ‘humankind’ which does not sound right in this situation. The words ‘data’ and ‘know-how’ just do not match well here and could change the meaning slightly. Again, I have kept the word ‘people’ as this is hard to paraphrase. Any questions? , comment below. 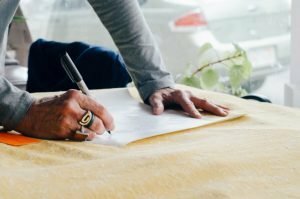 Do you need help with your writing? take a look at the Writing Correction Service here.